When I’m writing Sleep Plans for parents I don’t just include the sleep schedule. The uniqueness of my plans provides both a feeding and sleeping schedule for my parents and baby, which is why when I saw this amazing new product I fell in love. The aden+ anais Serenity Star is an electronic feeding and sleeping system that combines every nursery essentials into one functional, modern 5-point star design. This is it guys. The one-stop-shop of every nursery must-have. All rolled into one gorgeous design. Electronic Feeding Diary: Moms can record feeding start times and which side (L or R) baby last fed from (if nursing). All the information is displayed on the easy to read LCD screen, paired with a handy 12-hour AM/PM clock. 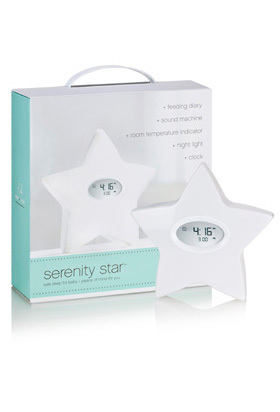 Even the most tired of moms can record and remember this information, thanks to the Serenity Stars easy functions and display. Sound Machine: plays four soothing sounds including 2 lullabies, heartbeat, and white noise that can be set for 30 minutes, 60 minutes, or for continuous play, all creating a perfectly peaceful environment. Room Temperature Indicator/Nightlight: When the nursery is at an ideal temperature, it emits a soft white glow for the perfect nightlight. If the room temperature rise above 23.3 degrees Celsius, the glow will turn red to indicate the room is warmer than recommended. 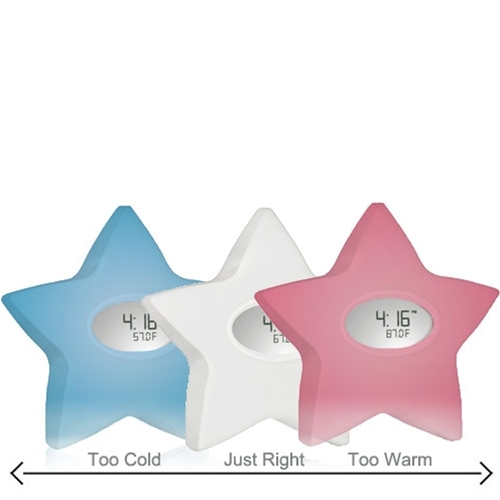 If it drops below 17.7 degrees Celsius, the Serenity Star will emanate a blue glow as a recommendation to adjust the room temperature and/or the baby’s clothing. Portable: compact size, dual plug-in and battery-powered operation makes it perfect for travel. Leave all the other gadgets at home! All you need is this. This is an amazing addition to your nursery and the perfect present for a mom-to-be. This is the first system to combine the variety of helpful feeding and sleep aids, all in one, which contributes to peace of mind for you. Our friends at Simply Green Baby in Oakville have the Stars in stock and the BIG NEWS is that they are donating one as our big giveaway during out City Parent Sleep Event! Join Good Night Sleep Site and City Parent Magazine on July 25th, from 1:30-3:30 for City Parent’s first ever online Sleep Clinic. I’ll be online with you to answer all of your sleep questions and there will be many giveaways! I hope you can join us and good luck winning this amazing innovative product from aden + anais. When I had my first daughter I wanted to start out right with her. I began to second-guess all that was around me. What cleaner did I use on the floors she would be crawling on? What was in the laundry detergent I’d be washing her clothes in? Recycling today would help her world in the future. It was time. My world, my home, needed a change and it needed to happen now. So began my journey. I spoke to whomever I could. My friend Google and Facebook helped me with my research. Throughout Operation “Change My Ways” the words “phosphates” and “formaldehydes” kept jumping out at me. It was time for a major overhaul. Out came the cardboard box and in it went pretty much everything under the sink and in the laundry room. Gone was the “no tears” baby shampoo and “made with natural oatmeal” baby creams. While I wasn’t quite ready for the bottle of vinegar and water as my new kitchen cleaner (I’ve since converted and love it) I tried to make the best “green” choices as I could. It was all natural for my offspring. Natural cleaners, natural shampoos and creams. I felt good about my choices for my new baby and it continued when I had my twins. Then one day it hit me. I’m making all the right choices for my kids, why can’t I do the same for myself? I had yet to part with all my “necessities” and natural wasn’t in the ingrediants. As a work at home mom of 3 with her own business, I didn’t have time to go here, and order there for my kids. Source out and try multiple “natural” shampoos and conditioners that can still tame my unruly mop. I wanted to be able to go to one company where I could go for the whole family. One that I could trust their products and what they stood for. And I got lucky. I not only found one company…I found two…two companies and two lovely ladies. 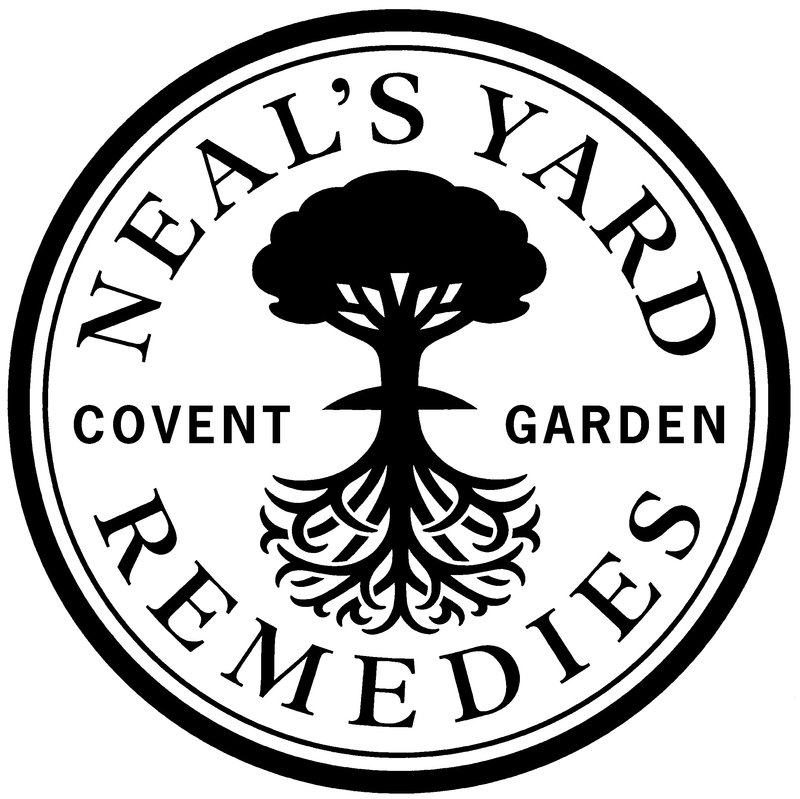 The first is Neal’s Yard Remedies, sold by the amazing Grace Moores. NYR celebrates over 30 years of natural and organic health and beauty products, all independently certified organic by the Soil Association. While all their products are amazing there are two that are perfect for mom and baby in these hot summer months. 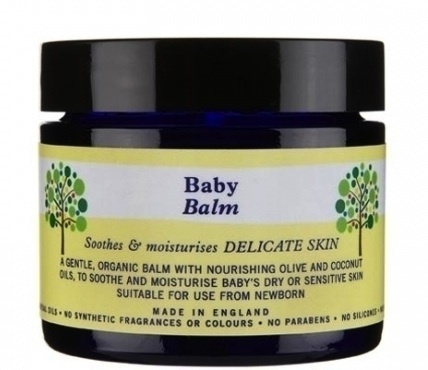 A great product for your little ones this summer is NYR’s Baby Balm. Not only is it 100% natural, it is also 100% organic. With only 4 ingredients it’s safe to use on infants, children and adults and is must have for your home. It protects and calms the skin with a combination of gentle, moisturizing ingredients, including olive oil, coconut oil and shea nut butter. This product is fantastic on dry, wind/ sunburn or chaffed areas such as the face, body, bottom. Unscented so mom, (and dad!) can also use it on their work worn hands and dry skin. It can also be used for cradle cap, rashes, lip balm, a diaper barrier, dry hands, feet, elbows and knees, plus helps heal minor cuts and burns. Clear out the medicine cabinet. All you need is the Baby Balm! Available at Health Centre of Milton. **Tip** Add a drop of eucalyptus essential oil and you have an effective vapor rub for those over 6 years of age. 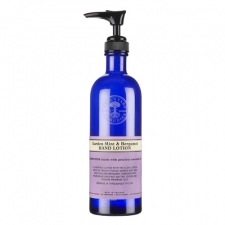 And Moms who love to garden, NYR’s Garden Mint & Bergamot Hand Lotion is a must for hot days. The Aloe Vera and Garden Mint arecooling to the skin, and simply apply it to the back of your neck and hands to feel refreshed and hydrated. Its non-greasy and certified 95% organic. Available at In the Ville in Campbellville. My next fabulous find and fab lady is Olivier Soaps sold by Pamela Wood. 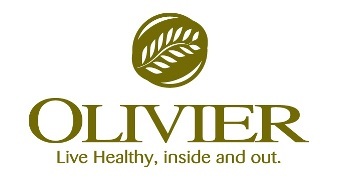 Olivier Soap is a family-owned and family run company that hand-crafts olive, cocoa and coconut oils into extraordinary skin care products. The best part is their products contain absolutely no harsh chemicals, animal fats, artificial coloring or alcohol-based aromas. My first choice is Olivier Mon Bebe Soap. Mon Bebe soap is a SAFE soft and creamy soap for babies and kids of all ages! It contains powerful moisturizing ingredients such as cocoa butter, olive oil, calendula and sweet almond oil to penetrate your child’s skin and scalp. Great for all kinds of skin conditions too. It can be used all over including your child’s hair! It smells amazing and the best part is that it does not contain any chemicals, toxins or animal fats. And mom’s I didn’t forget about you! 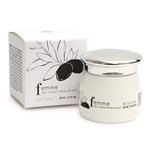 Olivier’s Femme Day Cream is Olivier’s top seller. It is so soft and light! Perfect for summer! The combination of all natural ingredients in this cream make it a powerful tool for anti-aging, wrinkles, sensitive and dry skin, acne and oily skin. It is an astringent that helps to tighten and close the pores, sealing in moisture. This product contains carrot seed oil, which is known to naturally help your skin to protect itself from the sun.